Established in 1964, the Red Geranium Restaurant is one of the region’s most charming and romantic restaurants. Serving breakfast, lunch, dinner, and weekend brunch, the Red Geranium Restaurant offers Seasonal American Cuisine and Midwest favorites. The restaurant also offers an extensive international wine list, and diners may enjoy three distinctively dining rooms. View our menus. The Main Dining Room captures the romance and Old World charm of the 19th Century. The Green Room offers comfortable benches and a cozy, casual atmosphere. Ornate hand-carved doors grace the entrance of the third room, the Tillich Room (named for philosopher, Paul Tillich). The dining area offers a panoramic, pastoral view of a serene lake. At night, the warmth of a large fireplace adds to the romantic setting of the room. The Red Geranium’s Wine List offers a wide selection of fine varietals from the best regions around the world. 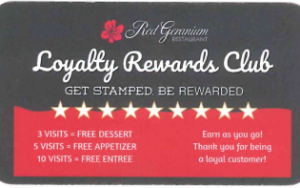 Our new Red Geranium Restaurant Loyalty Program is active. Ask your server for details! Are you searching for a place to host your party? The Red Geranium Restaurant is the perfect place for birthdays, anniversaries, graduation and rehearsal dinners, or any other type of dinner party. Contact our Sales department for details at 812-682-4431 ext. 6168 or send us a message! Red Geranium Restaurant 1-812-682-4431, option 3. Thank you for dining with us.